February 8, 2012 | David S. Maldow, Esq. Last October, our friends at LifeSize provided us with a quick test drive of LifeSize Connections, their new cloud based videoconferencing platform, which was in beta at the time. The resulting article includes a quick description of the solution and our initial thoughts. 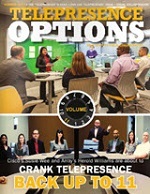 Since that time, LifeSize Connections has been made available to the public and Telepresence Options was given an account with 20 seats for testing and day to day use. Hey, it's cool to be an industry analyst and technology journalist, but don't be jealous. You can get a 30 day trial and check it out for yourself. After using the solution for several weeks, I can say that it has met or exceeded all of my expectations. LifeSize's platform has the quality, reliability, and functionality of competitive business class solutions, along with the ease of use associated with commercial offerings. I expect to keep it among the short list of desktop VC solutions that I allow in my very exclusive startup menu. Please see the following YouTube video for a quick overview of LifeSize Connections before we dig into the list. After weeks of real world testing over the public internet, I am pleased and impressed with the meeting experience. We hosted successful meetings (point-to-point and multiparty) using a variety of computers, webcams, microphones / headsets, and networks. The solution provided complete reliability under all tested conditions. Please note, when I say it was reliable, I don't simply mean that every call connected. I mean that we noticed no quality compromises that served to distract us from our meetings. Every VC user knows that moment when you say, "Hey, your video got messed up, that was strange. Ummm, what were we talking about?" That moment didn't arise in our testing. This is a situation where seeing is believing. Therefore, I recommend trying it for free and judging the video quality yourself. LifeSize has not re-invented the wheel with its main UI, and that is a good thing. 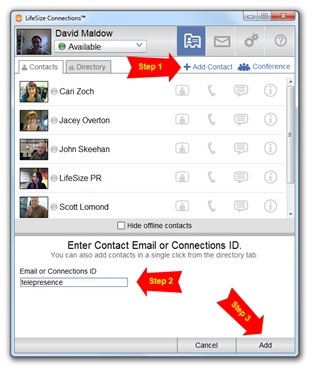 Most computer users should have some familiarity with a basic contact list and require zero training to use this interface. I particularly appreciate the minimalist design. There are no infrequently used buttons cluttering up the interface and causing confusion. As you can see from the image above, each contact has four easily identifiable icons to the right of the person's name and picture. Clicking these buttons allows you to audio call, video call, text message, or check the info of each contact. Why make it more complicated than that? I was glad to see the inclusion of text messaging, as I feel it is a vital tool for helping people transition to ad-hoc videoconferencing. 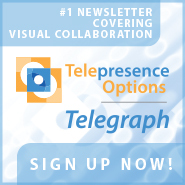 Many people are still a little shy about cold video-calling, so they email or use the phone to set up video meetings. That is not ad hoc conferencing. Text chat is the perfect solution to this problem. It is not a business social faux pas to send someone a quick IM asking if they are currently available, before inviting them to a video meeting. The ability to access IM and video from the same contact list makes this very easy. I think we should all thank LifeSize for avoiding silly smiley icons in the text client. That is fine for consumer solutions, but we could do without them in our business tools. With such a clean and simple UI, one might suspect that LifeSize has just hidden the confusing options in the settings menu. However, I was pleased to see that even the settings menu was designed with ease of use in mind. This is always a tough design problem for vendors. They must present some sort of settings menu for advanced users, but they don't want to let the less savvy users get into too much trouble. LifeSize does a great job of balancing these concerns. There are three things that every desktop VC user needs to be able to easily check. 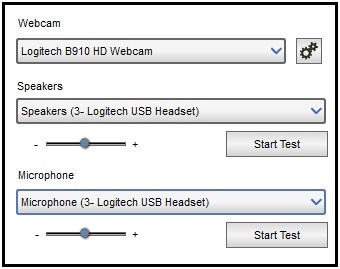 These are the microphone, webcam, and speakers selections. The settings menu provides a simple drop down for each of these items, making it very easy to verify your choices. There is also an advanced menu, but most users shouldn't need to worry about those settings. What differentiates a business solution from a commercial solution? That line is getting finer and finer as commercial solutions improve their quality and add business collaboration features. But ask any IT manager and they will tell you that they need certain administrative functions from their communications platforms. In particular, admins need to be able to easily provision their users and room systems (remember, the LifeSize Connections platform supports both desktop and LifeSize room systems), as well as generate call data and usage reports. LifeSize Connections makes it very easy to perform these tasks. Often, communications solutions will neglect to make the admin UI user friendly. The thought process is that it is worth spending development time to create a friendly UI for your non-techy users, but administrators do not need to be hand held. LifeSize seems to understand that not all of the potential SMB customers for this solution will have a tech savvy admin on hand, and as a result they have created a very easy to operate administrative system. While this feature is becoming standard on these types of offerings (as it should), we do think that LifeSize has done a particularly good job of integrating its guest accounts. From the perspective of the account owner, and the guest, it is a very easy process. This feature is the key to extending the reach of your LifeSize Connections platform. 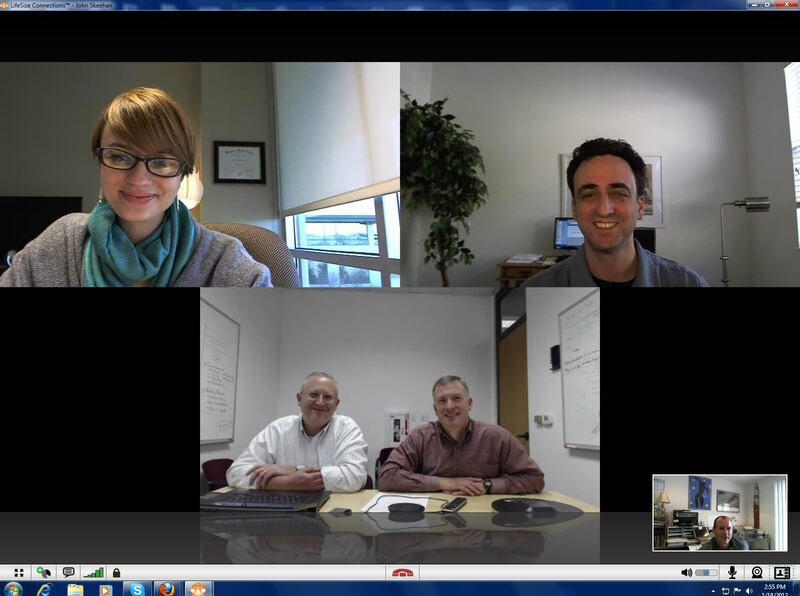 In effect it allows you to invite anyone with a computer and webcam to a video meeting. Rather than just using video with your colleagues, you can improve the impact of client meetings with video. Set up is simple: Users click "Add a Contact" and enter the guest's email address. That is literally all that is required to create a guest account. Guests will receive an email with simple instructions allowing them to download and install the client, and login. One minor nit, guests must copy a 10 digit code from the email, and enter it into the client when logging in for the first time (as shown in the image above). While this is not terribly complicated, it would be preferable if this was somehow automated. Ideally, guests would click a single button in the email which would then perform as much of the process as possible. That being said, it is already easy enough for almost all potential guests. The client downloads and installs in minutes without requiring many choices or clicks from the guest. After copying and pasting the guest code from the email, the guest will log in to the same contact list UI as account holders. The main difference is that guests will only have one contact in their list, the account holder who invited them. 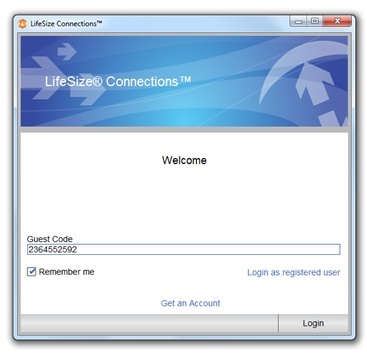 There are many other things to like about LifeSize Connections (even the notifications that it provides when your contacts log in are well presented). While some may complain that it is sparse on the advanced features (no whiteboard, recording, videomail, etc.) I am not quite sure that this is a problem. There are solutions available with more advanced features for users who require them, and LifeSize can always choose to add them if their customers request them. But as an initial offering, I think it was wise to focus on the basics, providing a solid videoconferencing experience in a zero-training required package. 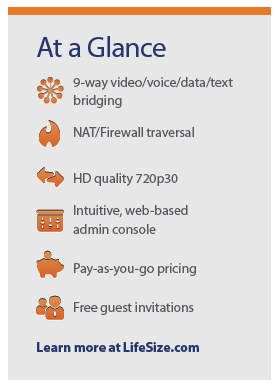 For $30 per user per month (which includes unlimited minutes and guest accounts) LifeSize Connections offers a killer combination of business class features and quality with consumer level ease of use. After weeks of real world testing over the public internet, I am pleased and impressed with the meeting experience. We hosted successful meetings (point-to-point and multiparty) using a variety of computers, webcams, microphones / headsets, and networks. The solution provided complete reliability under all tested conditions. Please note, when I say it was reliable, I don't simply mean that every call connected. I mean that we noticed no quality compromises that served to distract us from our meetings. Every VC user knows that moment when you say, \"Hey, your video got messed up, that was strange. Ummm, what were we talking about?\" That moment didn't arise in our testing. Set up is simple: Users click \"Add a Contact\" and enter the guest's email address. That is literally all that is required to create a guest account. Guests will receive an email with simple instructions allowing them to download and install the client, and login. One minor nit, guests must copy a 10 digit code from the email, and enter it into the client when logging in for the first time (as shown in the image above). While this is not terribly complicated, it would be preferable if this was somehow automated. Ideally, guests would click a single button in the email which would then perform as much of the process as possible. For \$30 per user per month (which includes unlimited minutes and guest accounts) LifeSize Connections offers a killer combination of business class features and quality with consumer level ease of use.